In which I take the occasion of the film’s release on 4K Blu-ray disc to examine how it was unjustly vilified when originally released. 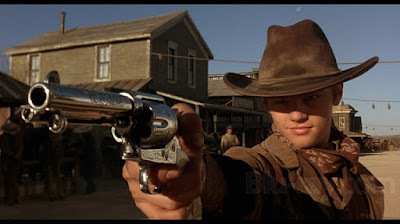 No one talks about Sam Raimi’s foray into western territory anymore. The Quick and the Dead was released in 1995 to a small box-office return and a critical cold shoulder. 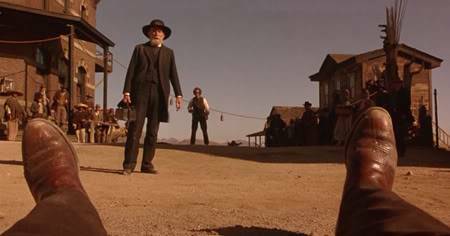 Watching the new 4K Blu-ray, I can announce that this is one of the most beautiful Westerns ever filmed. 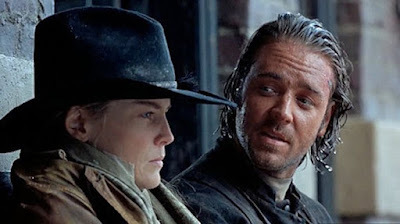 The Plot In Brief: Ellen (Sharon Stone) rides into the town of Redemption to participate in its annual showdown contest. The contest is brutal and bloody and ruled by the town’s demonic mayor Herod (Gene Hackman), who uses the contest to keep the town’s residents under his thumb. 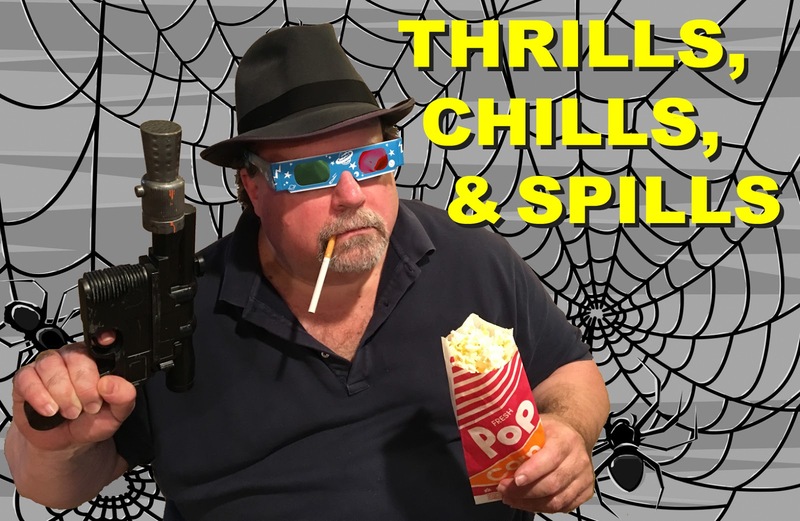 The contest attracts assorted braggarts and hired guns, but the two most interesting are Cort (Russell Crowe), a reformed bandit-turned-preacher; and the Kid (Leonardo DiCaprio), a local gunslinger who may or may not be Herod’s son. Is anyone a good enough shot to defeat Herod? Does anyone think that Herod is playing fair? Will we ever discover why Ellen entered the contest to begin with? There is a lot to like in Raimi’s film, and that is why I am baffled by its initial critical reception. 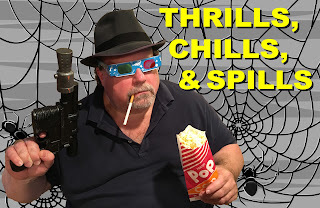 True, the story doesn’t work as a dramatic narrative; it’s just a loose laundry line upon which to hang a series of dazzling shoot-out set pieces. The audience keeps wondering why anyone in their right mind would live in this town; the locals just mill about like moping sad sacks waiting for the next terrible event. Yet I wonder sometimes if the real appeal of Westerns lies in narrative at all. Like the musical, are we not there primarily for the predictable, soothing tropes of the genre—its highlights, if you will? Of course, you can have a great story in a Western; but you can also have a great Western without much of a story. That being said, there is more good in this film than bad or ugly. The cinematography, supporting performances, and musical score lift this movie to the gates of the pantheon of greatness—the gates, mind you, not the actual pantheon itself. Dante Spinotti’s camerawork is never less than stellar. His camera captures the grit and majesty of the American West and there are individual shots that will take your breath away. (One particular medium shot of Russell Crowe and the town’s blind shoeshine boy looks like an oil painting by one of the old masters.) Spinotti’s expert camerawork achieves a goal I hitherto thought impossible: he is able to hide the fact that film was made at Old Tuscson Studios in Arizona. Most Westerns filmed at the famous studio loudly announce themselves by showcasing the workhorse standing sets of a saloon and adobe church house (think Tombstone and The Three Amigos.) Between the set designer’s re-dressing and the film’s careful framing, you would be hard-pressed to recognize it here. Spinotti makes us see the familiar in a new light. I have never kept secret my love of talented character actors and this film contains the mother lode, both in actors new to film and favorite seasoned veterans. I would argue that The Quick and the Dead’s supporting players are so good that they overshadow the leads. We have Russell Crowe in his first American film; Leonardo DiCaprio just two years before becoming a superstar in Titanic; Tobin Bell, Kevin Conway, Keith David, Lance Henriksen, Pat Hingle, and Gary Sinise in small roles; and Woody Strode and Roberts Blossom in the final film of their respective careers. All of them are terrific and memorable in The Quick and the Dead, even if some of them are afforded precious little screen time. The music by Alan Silvestri is terrific; it is at once homage to and pastiche of classic Western scores, particularly the work of Ennio Morricone and Elmer Bernstein, but still manages to be its own thing. Silvestri has written more than 100 scores, but excepting Back to the Future II and Young Guns II, this is his only Western score. It is appropriately soaring, scathing, sad, foreboding, and violent, but never calls attention to itself like some musical scores. It easily doubles the pleasure of the film itself. Could the film’s relative failure be due to the casting of a female in the lead role in a genre famous for testosterone-fueled narrative? Sharon Stone’s performance is not one of the highlights of the film, but it’s not embarrassing. She holds her own with Gene Hackman, The Man Who Never Gave A Bad Performance. I agree with 100% of everything you said here. This movie is so much fun. I'll always have a fondness for it because it was a gateway Western for me when I was young. It felt like the MTV Western and that made me more comfortable and curious with diving into the genre more as an adult. 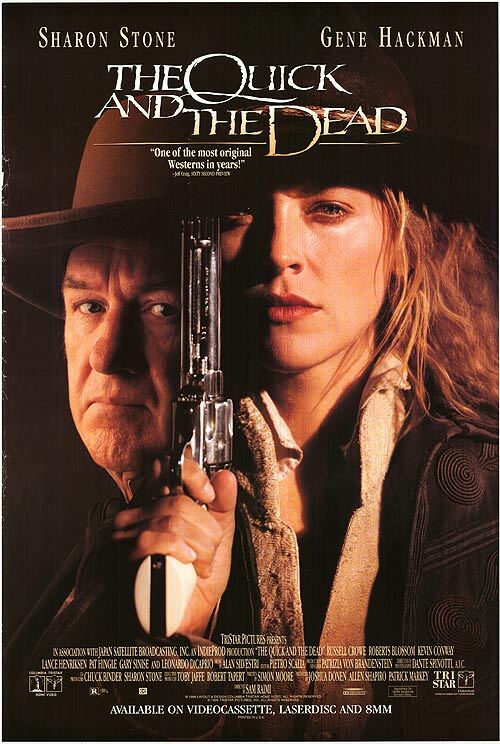 The Quick and the Dead is easily my favorite Sam Raimi film. And is an extremely entertaining western. I might go so far as to say this is my very favorite western (it's not, but it could probably crack my top 5). The plot is totally forgivable in my opinion. There's a shootout contest, and all the best gunslingers from all the other western movies show up to compete (each for various reasons). It's meant to be silly, stylized, over-the-top fun and I can't fault it for accomplishing what it set out to do. People love Evil Dead II, which is a silly, stylized, over-the-top fun version of a horror film. As you mentioned, both the cast, and the the supporting cast, are incredible. An ensemble that never gets credited anywhere (other than fthismovie.net of course). Sharon Stone isn't exactly giving an all-timer performance, but in the context of the film I like the way her weaknesses further her character. Her whole bit is that she's super vulnerable inside and putting on a hardened exterior for the sake of surviving this crazy contest. It works, and as you said, she holds up fine in scenes with established acting greats, amazing character actors, and future movie stars. My wife (then-girlfriend) and I were 2 of the paying customers at a theater in 1995 and we had a blast with it. When it comes on cable we definitely tune-in, and I'm just waiting for my son to get a few years older before I show it to him. Can't wait. Love this film and 100% agree.